RSBL-SOL Blanket | ZIRCAR Refractory Composites, Inc.
ZIRCAR Refractory Composites, Inc. insulating blankets are non woven, inorganic, fiber-based products that contain no asbestos. They are engineered for use as thermal barrier materials in high temperature applications up to 1400°C (2550°F). Commonly used in the molten metal casting and heat treating industries, ZRCI materials are also used as specialty gasketing in the fuel cell, nuclear, glass and electronic industries, as well as many other applications which require high temperature stability and low thermal conductivity. They also offer excellent corrosion resistance and unique handling strength for easy die-cutting, wrapping and forming. ZRCI Silica-Magnesia Blanket Type RSBL-SOL is made from soluble NON RCF fiberformed into a mechanically needled flexible blanket capable of withstanding continuous operating temperatures up to 1400°C (2550°F). It is designed to have enhanced in-vitro solubility characteristics. The fibers are soluble in body fluids and offer users an alternative to refractory ceramic fiber blankets. Type RSBL-SOL Blankets meet European regulatory requirements (Directive 97/69/EC). Type RSBL-SOL is an inorganic, needled insulating blanket which is manufactured using 1400°C (2550°F) spun fibers. These extra long spun fibers, cross-locked through a unique forming process, produce a blanket with good handling strength. It has excellent chemical stability and is unaffected by most chemicals except hydrofluoric and phosphoric acids and concentrated alkalis. If wet by water or steam, thermal and physical properties remain unaffected after drying. Type RSBL-SOL Blankets also provide superior resistance to attack from molten aluminum alloys at high temperatures. Type RSBL-SOL Blankets provide solutions to a variety of heat processing problems. They are available in a variety of thickness and densities. They are ideal for use as furnace insulation in sintering, heat treating and chemical thermal process systems. They can be layered between rigid insulation, wrapped around process piping or fabricated into folded modules. They are also useful as insulation packing in furnace spaces, around furnace sight tubes & ports and fill in expansion joints and masonry cracks. Highest melting point of any soluble fiber. Ideal for applications where RCF are not desired. Insulating Values: The following table summarizes the insulating characteristics of RSBL-SOL (8 pcf density). Silica-Magnesia Blanket Type RSBL-SOL is made from soluble NON RCF fiber formed into a mechanically needled flexible blanket capable of withstanding continuous operating temperatures up to 1400°C (2550°F). It is designed to have enhanced in-vitro solubility characteristics. 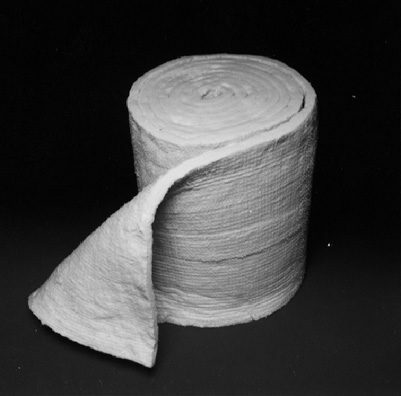 The fibers are soluble in body fluids and offer users an alternative to refractory ceramic fiber blankets. Type RSBL-SOL Blankets meet European regulatory requirements (Directive 97/69/EC).